Tom Wodetzki of the Mendocino (CA) AfD chapter and his step-daughter Alexei led last Saturday's Occupy SF march holding this banner, which was made by Fort Bragg AfD friends for their Move to Amend entry in the Mendocino 4th of July Parade. Tom and Alexei were followed down Market Street by 1,000 militant chanting folk--you can see the video here. 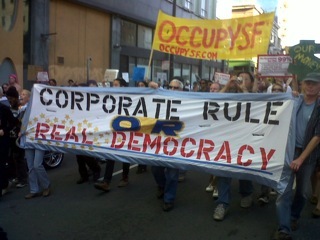 Tom also attended OccupySF's Friday and Saturday General Assemblies. This isn't the only occupy action that Tom and other AfD people have been involved with; there's also ongoing Friday afternoon protests in front of Bank of America and Chase offices in Fort Bragg. You can connect with efforts on the groups's Facebook page.